I felt like doing show and tell with wine today. So here are two wines we’ve enjoyed in the last few weeks. 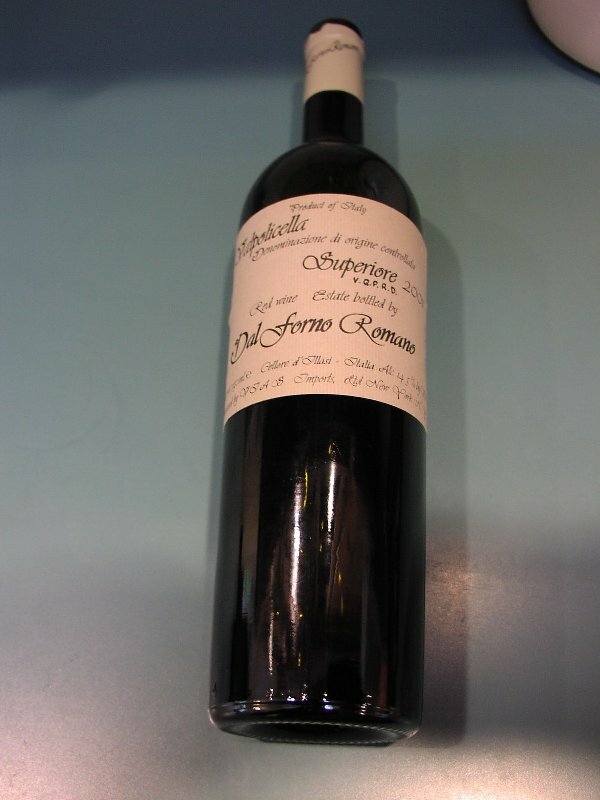 The first is a wine from Verona, a Valpolicella, bought for us by a friend (hi Pam!) which we drank the other day when I hit the 50,000 word mark on Hild. It was lovely: soft-spoken, but with a kind of fruity heft just right for the hot-day-turning-to-perfect-evening. Despite the softness, it had some structure (unlike those flabby American merlots that everyone in the world except me thinks are so fine, pah). These were grapes from a land under cultivation for millennia. Well-bred, with a hint of steel. We spent an hour on that wine and a handful of walnuts as the sun was going down. Dragonflies added their titanium zip overhead; lamb and sausage braised with onions in the kitchen. We smiled at each other a lot, feeling full, and tired, and happy from a day’s good work. 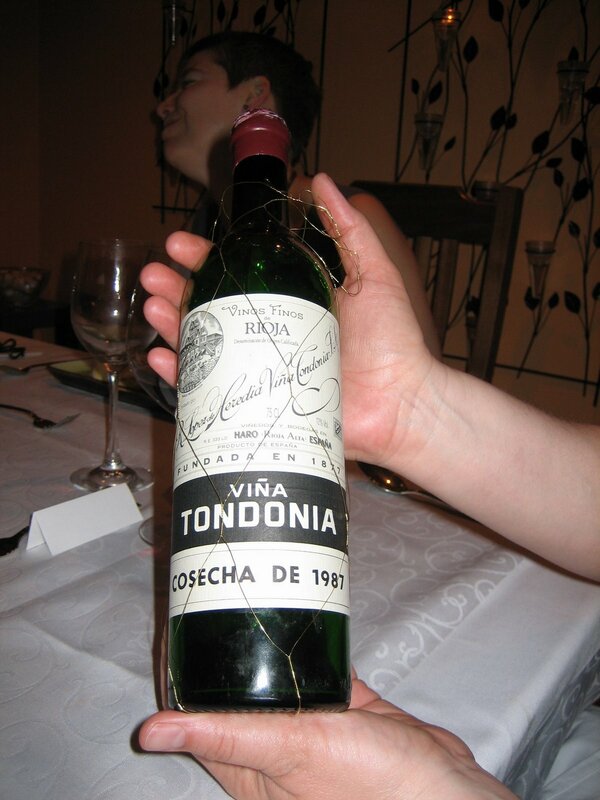 The second is the wonderful 21-year old Rioja we drank at our anniversary dinner. Great wine! And now, back to my first love, beer. Y’know, beer is like tea or bread for me, so fundamental that I can’t rave about it, or wax lyrical. I just…drink it. Aaah. Yes! Flabby is exactly the word to describe American merlots. Sometimes, though, they’re less annoying than one-dimensional over-muscled American cabernets.An ugh on both their houses, I sez.–P. Does anyone have a favorite type of wine from a favorite country?I definitely agree that American wines are just not that great compared to others. I haven’t found any one country that tops the rest, but I’m currently basking in Shiraz wines. They’re so round and full of flavor! p, I have sampled American wines extensively and have yet to taste a single red that I like–certainly one that I think is worth the price. European wine (especially French, Spanish, Italian and Portuguese) knock them out of the park.janine, I have a long, long list of < HREF="http://www.nicolagriffith.com/like.html" REL="nofollow">things I like on<> my website, which includes a few wines (I could have gone on much, much longer on that subject). Nicola, thanks for the link.Isn’t it nice to be able to link to things that would take much too long to explain? :) Ahh, internet. But we have different tastes in books? How do you like it? It amazes me that we can find information on that stuff! Well, the thing is, we can’t find that much information. So most of the book is scholarliness for scholarliness’ sake, y’know? But I did find a fun poem that I might do a blog post about.